Hello. Thank you for visiting my site. Please bear with me as I update and secure this site so you can enjoy all the wonderful ideas to make your child's room ideal for him/her. Are you stumped for ideas for decorating kids room? We are all aware of wall decals. They are super popular as they are not too expensive and yet they are easy enough that your kid could put them up himself. 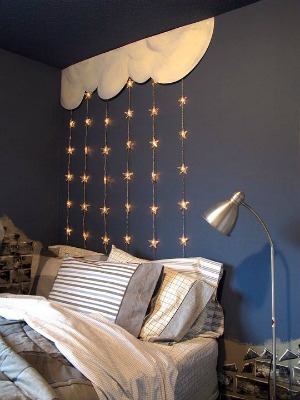 Since they do not damage the walls, they are a wonderful way to decorate dorm rooms too. Here are 10 ideas (gathered from around the net) that might help you come up with something unique in your childrens room decor. Creating a beautiful wall display is as easy as choosing the right photograph! Choose your favorite photo and have it developed to poster size. Remember to check the size of your frames to be sure that the photo will fit. Cut the poster in 3 or 4 sizes to create the look as above. Beautiful wall decor ideas are simple, don't you think? What an adorable way to dress up the night stand! 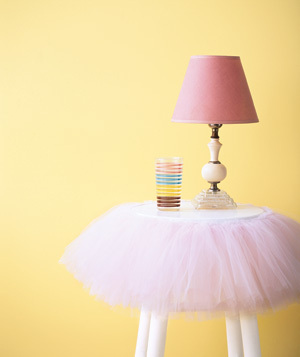 Simply hot glue or double tape a tutu or two (ha ha) at the edge of the table for a totally feminine look. Perfect for your ballerina themed room. This has to be my absolute favorite childrens room decor idea. Don't see anything out of the ordinary here? Here's the secret - the decorator of this room created the wall art behind the bed by simply using the colors of the bedding. Just think about it. You don't need to comb the shops or crawl the web for the perfect painting for the room. Just create it. Pompoms give volume and brighten up the room in no time at all. I especially like to decorate with pompoms. They are super easy to make - all you need is tissue paper, ribbon and craft time. You can create different sizes and any color scheme you like. 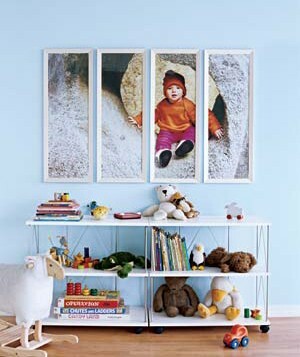 Stack them together like in the photo when decorating kids room. It feels like a party that never ends! Growth Charts are long and cover more than half the wall. As such they make great art works. 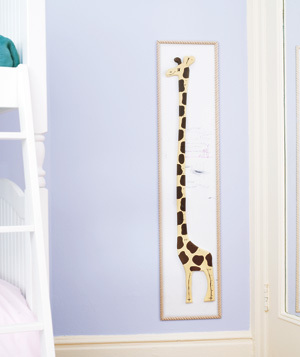 The kids room decor gets a boost when you frame the growth chart to serve a dual purpose. Okay come on. How adorable and easy to put up are these? I love the cloud effect they have given at the top of the wall. Now this is a room made for sweet dreams. Think out of the box. String lights come in so many themes that you can easily put your own spin to the room. 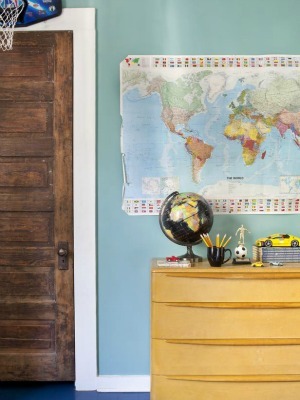 Maps and Globes are great for decorating kids rooms especially young boys bedrooms. There are often home decor items that we had bought long ago. They get put up in the attic when you change the decor. 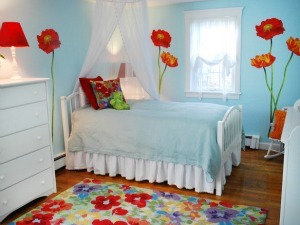 Why not bring them out, update them (paint a new color or shine up the gloss) and put them in your kids bedroom. Potted plants would also be a great addition to any child's room. So just take a look around your house and you might find just the thing for your childrens room decor. To continue with the theme to decorate with what you already have...use some of your kid's toys, lego creations and books to decorate the bedroom. As in the picture, the cabinets are really the highlight with the sunny yellow, pale yellow and light grey backgrounds. Pick a few pieces from their horde of toys to showcase. 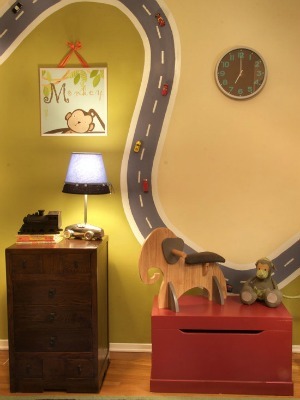 Every little boys dream bedroom just have to have a long curvy road along the wall for all his cars to drive around. Add some magnetic paint to the road and double the fun! Did you notice the different color schemes on both sides of the road? Very innovative...and super easy home decor wall art! We come back full circle to wall decals. I guess that we just could not possibly complete an article on childrens room decor without including these wonderful and super easy ways to create a unique kids bedroom. Find the perfect wall decals for your kids room decor here. We hope these wall decor ideas and more have given you the inspiration to create your own unique kids bedroom. Did you enjoy this article? Was it informative? Tell us in a comment below. 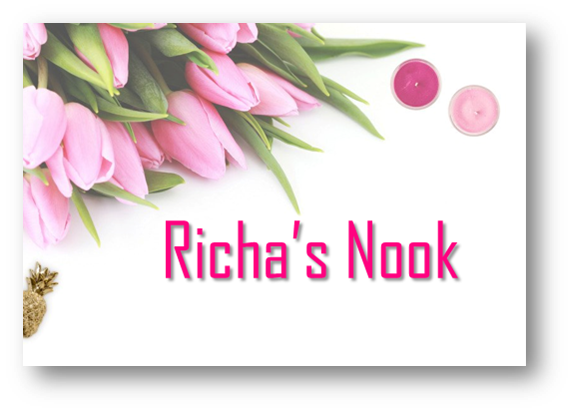 You can sign up for my free bi-monthly e-zine, Richa's Nook. This is a great resource of ideas, information and a casual fun read to help you relax and unwind. Join up if you want a great resource for ideas, information and a casual fun read to help you relax and unwind. 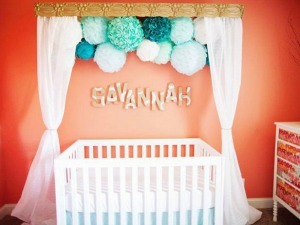 Did you love the picture of a shared nursery featuring these unique baby cribs? Here is where we break it down for you. Before you go shopping for your baby bath accessories, check out these tips and tricks. Baby Bath Tubs Reviews - Our Top Two !! Our best baby bath tubs reviews for 2019. Does baby's bath time make him scream and you anxious? You might be using the wrong tub. COPYRIGHT © 2009 - 2019 THIS DECOR MOM: ALL RIGHTS RESERVED REGARDLESS OF LINKS OR ATTRIBUTIONS. CLICK TO SEE MY PRIVACY AND AFFILIATES POLICIES.